Grandma's peppermint candy recipes make delicious peppermint drops for giving as edible gifts to family and friends, or simply for sucking on. Nothing store-bought tastes as good as old fashioned, homemade peppermints. Of all the homemade hard candies, peppermints are the most popular. 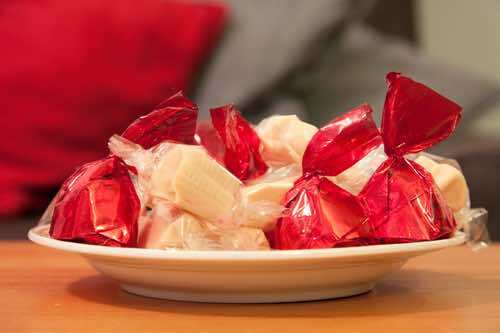 Do as Grandma did and wrap them individually in colored cellophane or waxed paper for gift giving or so you can carry them in your pocket to have handy whenever you crave something sweet. Mix together until sugar is dissolved 1 pound granulated sugar and 1/2 pint cold water. Add 6 drops oil of peppermint and cook for five minutes. Take from fire and stir a little until syrup becomes cloudy, then pour at once into small, greased patty pans, or drop quickly on lightly buttered paper from a teaspoon. This candy must be poured quickly, or granules will form. Colouring may be added before pouring to give a festive appearance. One cupful of sugar crushed fine, and just moistened with boiling water, then boiled five minutes; then take from the fire and add cream of tartar the size of a pea; mix well and add four or five drops of oil of peppermint. Beat briskly until the mixture whitens, then drop quickly upon white paper. Have the cream of tartar and oil of peppermint measured while the sugar is boiling. If it sugars before it is all dropped, add a little water and boil a minute or two. 1-1/2 cups sugar, 1/2 cup boiling water, 6 drops oil peppermint. Put sugar and water into a granite saucepan and stir until sugar is dissolved. Boil ten minutes; remove from fire, add peppermint, and beat until of right consistency. Drop from tip of spoon on slightly buttered paper. Mix 1 cup sugar and 1/2 cup boiling water; let it boil 7 minutes without stirring. Take from fire, add 1/3 teaspoonful essence of peppermint; stir until it begins to thicken; drop with a teaspoon on buttered paper.